Saturate farmlands with toxic pesticides, herbicides and fertilizers that then migrate into ground water, rivers, lakes and oceans. For example, many areas of Minnesota, which is prime farmland, now face the problem of having dangerously elevated levels of nitrogen in their drinking water. The conversion of grasslands and pastures into chemical-driven, industrial crop land has eliminated much of the natural filtering of ground water that such native landscapes typically provide. Health risks of nitrogen include a potential connection to cancer, as well as thyroid and reproductive problems in both humans and livestock. Modern fertilizer consists of varying amounts of nitrogen (N), phosphorus (P) and potassium (K). These three are believed to be essential for plants to grow, (below, I’ll discuss why NPK may not be as necessary as we think. ), and are extracted from the soil with each harvest. This is why farmers spread fertilizer on their fields, to replace the nutrients lost. It’s certainly not the ideal and sustainable way to farm, but it’s thought to be the most efficient for large-scale farms. Strategies like crop rotation and allowing large fields to rest would cut too deep into profits that are based on quantity, opposed to quality. Unfortunately, the Earth’s soil is now being depleted of nutrients at more than 13 percent the rate it can be replaced. Not only that, but according to some, we may also be facing looming shortages of two critical fertilizer ingredients: phosphorus and potassium. Unlike nitrogen, phosphorus and potassium cannot be synthesized, and our aggressive large-scale farming methods, which deplete soils of nutrients that then must be replaced, are quickly burning through available phosphorus and potassium stores. “These two elements cannot be made, cannot be substituted, are necessary to grow all life forms, and are mined and depleted. It’s a scary set of statements. Former Soviet states and Canada have more than 70 percent of the potash. Morocco has 85 percent of all high-grade phosphates. It is the most important quasi-monopoly in economic history. This largely unknown issue may end up playing a more significant role than you can currently imagine, because it cuts to the heart of the sustainability of modern agricultural practices, or rather the lack thereof. “[T]he next time someone facilely insists that the ‘industrial farms are the future,’ ask what the plan is regarding phosphorus,” Mother Jones writes. “Developing an agriculture that’s ready for a phosphorus shortage means a massive focus on recycling the nutrients we take from the soil back into the soil—in other words, composting, not on a backyard level but rather on a society-wide scale. By contrast, polyculture (the traditional rotation of crops and livestock) better serves both land and people. 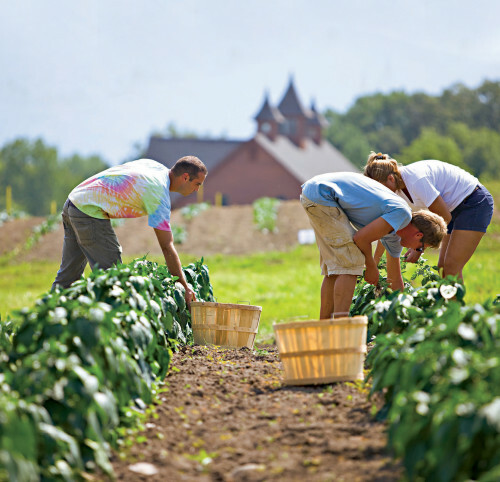 Polyculture evolved to meet the complete nutritional needs of a local community. Polyculture, when done mindfully, automatically replenishes what is taken out, which makes it sustainable with minimal effort. If it’s true that we may at some point face a shortage of phosphorus and potassium, large-scale farming facilities would be hard-pressed to produce much of anything after a short while. Such shortages might even lead to geopolitical strife, as phosphate rock is primarily concentrated in the occupied territory of the Western Sahara region of Morocco. It may sound farfetched to some, but how far would a nation go to secure access to such a location if the future of the entire agricultural industry and food supply depended on it? The evidence tells us that forging more sustainable alternatives is imperative if we hope to survive. Yet proponents of factory farms and genetically engineered crops argue that monocropping, or crop specialization, is the only way to feed the masses and that it’s far more profitable than having small independent farms in every township. But is this really true? A number of studies show just the opposite! In fact, studies are showing that medium-sized organic farms are far more profitable than ANY sized industrial agricultural operation. via How Organic Farming Prevents the Use of Fertilizers.